Pakistan is currently visiting Bangladesh to play a series of matches in all formats of the game. The three matches One Day International series is underway, Pakistan has won the series already 2-0. The third and final ODI will be played on December 6, 2011, at Zahur Ahmed Chowdhury Stadium, Chittagong. The series has been dominated by the bowlers so far so we will highlight three of best from each side, their career and performance in the first two matches. He is among the best all rounders of the game, started his career as a right-arm leg spinner againstKenyaon October 2, 1996, at Agha Khan Sports Club Ground, Nairobi. He proved his batting skills two days after making his debut while playing against Sri Lankaby thrashing the fastest century in ODI on 37 balls and still holds the record. He was the highest wicket taker in the ICC Cricket World Cup 2011, by grabbing 21 wickets. The 31-year-old has played 332 ODIs, grabbed 333 wickets at an average of 33.19 with the best of 6 for 38 runs. Boom Boom has taken five wickets in two matches at an excellent average of 14.40 with the best of 5 for 23 runs. He is one of the finest right-arm medium fast bowler and has shown his importance in all three formats of the game. The batsmen find it hard to negotiate with his lethal quick bowling and he has the ability to swing the ball both ways including perfect Yorkers. Gul made his debut against Kenya on September 4, 2007, and did not look back after that. 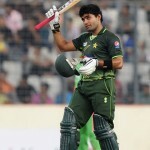 The 27-year-old took part in 97 matches, claimed 143 wickets at an average of 26.71 runs with the best of 6 for 42 runs. He pocketed five wickets in the series at a top class average of 11.00 with the best of 4 for 36 runs. He is one of the finest right-arm off spinners in the world and has reached the climax of the game by securing top position in the World ODI ranking currently. He made debut againstIndiaon July 2, 2008, at Karachi and has proved his worth by his accurate bowling which includes dangerous ‘Doosra’ as well. The off spinner has played 54 matches and has taken 76 wickets at an average of 25.23 runs with the best of 4 for 33 runs. The 34-year-old has yet to prove his worth in the series as he could manage just two wickets in even matches. He is among the best all rounders of the game and has done well for his side quite often. The left-arm leg spinner made his debut against Zimbabwe on August 6, 2006, atHarare. The 24-year-old took part in 121 matches and has taken 153 wickets at an average of 28.73 runs with the best of 4 for 16 runs. He has taken three wickets in the series so far at an average of 23.00 with the best of 2 for 42 runs. He is one of the senior members of the Bangladesh squad, a slow left arm spinner who has the quality of blocking the runs while taking wickets. He made debut against Hong Kong on July 16, 2004 atColomboand made impact by taking three wickets in the match. The left-armer has played 128 ODIs and secured 176 wickets at an average of 28.57 runs with the best of 5 for 29 runs. The 29-year-old has managed just one wicket in two matches and must be anticipating performing well in the final match. He is the spearhead of the fast bowling for the team who bowls right-arm and always tries to exploit the conditions. He made debut against Sri Lanka at Shere Bangla National Stadium, Mirpur, on January 4, 2010. The 22-year-old has taken part in 42 matches and has claimed 49 wickets at an average of 35.28 runs with the best of 4 for 21 runs. The youngster has taken two wickets averaging 29.00 with the best of 2 for 50 runs. Pakistan will anticipate winning the series with a white wash whereas Bangladesh will try to block them by winning the last encounter.